Yesterday marked the centennial anniversary of one of the most violent — and widely forgotten — incidents in Toronto’s history. On Friday, August 2, 1918, locals sparked what later turned into the worst race riots the city has ever seen. 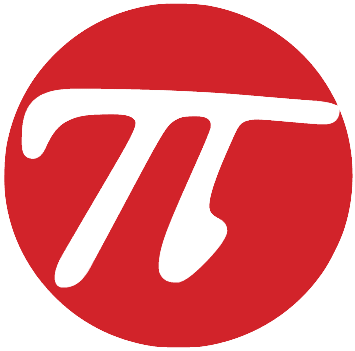 The target group? Greek immigrants. That fateful day, thousands of Canadians poured onto Toronto’s streets, attacking and destroying Greek-owned businesses as they went. However, it was an incident from the day before that triggered the event. On Thursday evening, a crippled World War I veteran had been kicked out of the Greek-owned White City Café. Drunk and belligerent, the returned soldier was behaving recklessly, ultimately crossing the line when he hit a waiter and was promptly thrown out after staff called police. At first glance the episode may have seemed insignificant, but it provoked widespread violence the following day, when thousands of people — veterans and citizens alike — mobbed in the heavily Greek-populated area along Yonge Street to loot and pillage every business in sight. The situation quickly became too dire even for police to handle, leaving Toronto’s mayor with no option but to invoke the Riot Act, which allowed the militia and military police to intervene; the next day, police forces fiercely engaged with rioters to stop the violence. Between both sides, an estimated 50,000 participated in what turned out to be the largest riot in Toronto’s history — and one of the largest anti-Greek riots in the world. Hundreds suffered injuries, including innocent women and children, and more than 20 restaurants were attacked and sustained more than $1 million of damages (according to 2010 standards). 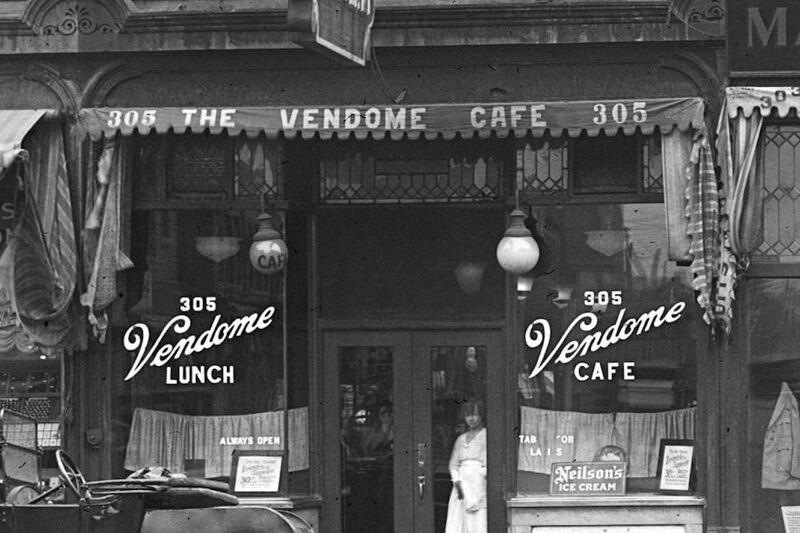 The Vendome Cafe on Yonge Street in Toronto. The cafe was one of the many Greek-owned businesses pelted with bricks and looted by rioters. The owners reported more than $1,500 in losses, but received no compensation. 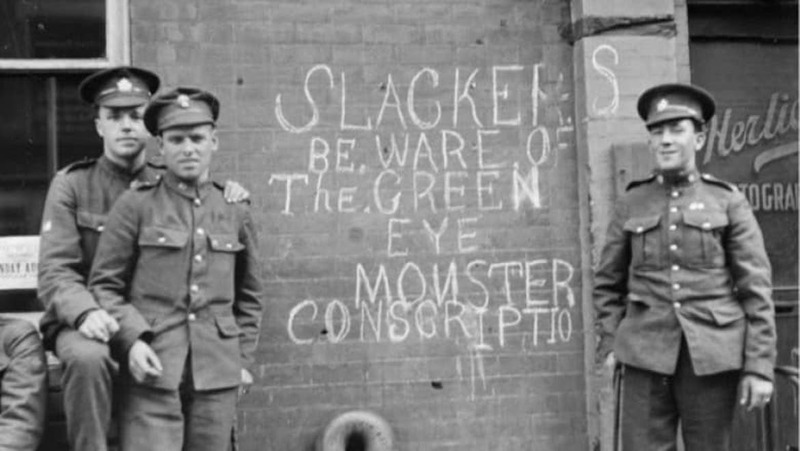 The riots had been fueled by anti-immigrant sentiment in Canadian society, as well as the false beliefs that Greeks did not fight in WWI and were pro-German. Moreover, after returning from the Great War, Toronto-born veterans found their hometown looking significantly different than it had been before they left. 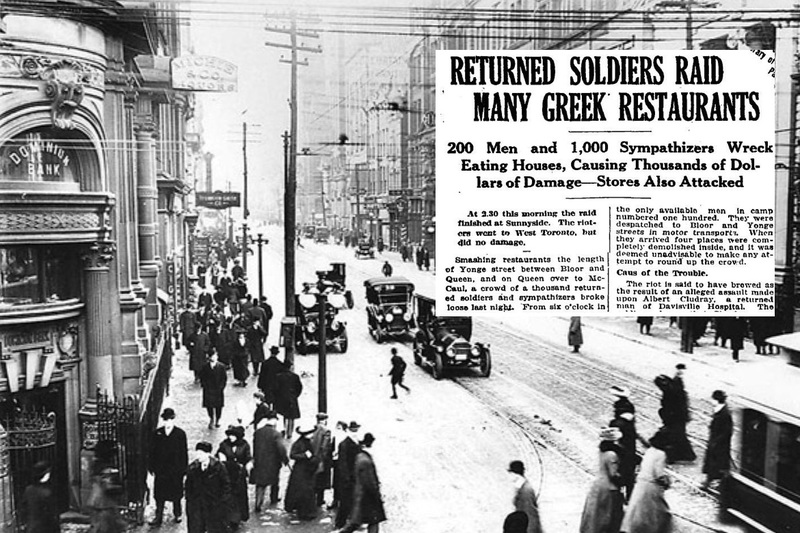 The fast-growing presence of Greek businesses on downtown Yonge Street especially angered the soldiers, as they felt that able-bodied Greek owners were building thriving businesses while thousands of Canadians sacrificed their lives for their nation. In reality, however, many Greek immigrants were not able to fight for Canada due to lack of citizenship. Nonetheless, after the massive riots, Greek community leaders issued an official statement affirming that they had indeed supported the Allied cause. They said Greeks with citizenship were joining the Canadian army and that more than 2,000 Greeks — especially from Toronto — were in the Canadian Expeditionary Force.